Once again we follow the adventures of REH's Conan of Cimmeria as he gets himself into trouble with an evil wizard named Ethram-Fal. Ensorcered with a spell that is slowly crushing the life from him, Conan joins forces with a sorceress named Zelandra, a woman who is addicted to the narcotic of the Green Lotus. Adventure and peril await them at every turn as they journey across the desert in search of Ethram-Fal and a way to free themselves from his afflictions. As Conan tales go, it's the not worst stand alone Conan novel I've read. 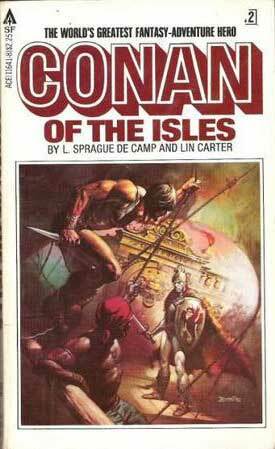 As with the majority of Conan stories written by people other than Robert E. Howard, or enlarged and edited by Lin Carter and L Sprague De Camp, this one treats Conan as a fairly cardboard character. Under Howard's writing Conan was a vital, energetic personality. With the exception of Swedish Conan author, Bjorn Nyberg, every other Conan writer seems to fail at projecting any real vitality and zest into their Conan creations. Conan and the Emerald Lotus is an easy read on a slow afternoon, but it's certainly not going to get fans of REH's most popular character all that excited. Mr Hocking has certainly written a Conan novel to the same standard as all the other recent authors who have tried their hand at the Conan 'game'. And that's the problem I think. None of the more recent Conan authors seem to be aiming very high. None of them seem to be able to write a really terrific, nail-biting, eerie Conan tale. Their stories (much like the Emerald Lotus) just start at point A and follow a fairly predictable journey to arrive at point B. One never has any feelings for either their version of Conan, nor the people he meets and interacts with along the way. The women are all copies of one another. The villains are interchangeable. The secondary characters are just there to fill out the story a bit and give Conan someone to talk to. In short I'm afraid I have to say that despite this latest addition to the Conan franchise of books... and that's what it is.... just a money maker... not a labour of love I feel. Still, no one has managed (with the exception of Bjorn Nyberg and his Conan the Avenger novel some years ago now) to portray the Cimmerian as REH himself did. If one picks up Conan and the Emerald Lotus without expecting anything new or unique in regards to modern Conan writings, one won't be disappointed. But a REH style Conan tale it is not.